So you know it’s real. Beef on Weck may sound like some sort of disgusting mistake, but it’s really just roast beef on a roll with salt and carraway seed. Despite its relative simplicity, it’s a huge deal up here in Western New York. One of the supposed best is Charlie the Butcher, which has more than a few locations around town, including one in East Aurora. The East Aurora location, though, is is an express and resides within a gas station. Down in little East Aurora is a bar called Leo’s Pizzeria. Yes, I said bar. Yes, I said pizzeria. Because Leo’s is one of those rare breeds of drinkeries that just can’t be contained by one title. In fact, it would even be fair to call Leo’s a sub shop or a number of other things on the menu. But pizzeria fits, and I was looking forward to finding out just how good the pizza could be. Even Buffalo has succumbed to the nation-wide food truck craze, one of these going by the name of Lloyd Taco Truck. In fact, this truck seems to be so successful that it has spawned a fleet that even reaches sunny East Aurora. With high expectations, I once again set out far away from the land of Mexico to eat some Mexican food. What I found was a big green truck and a menu that sported some good-looking food if not authentic-looking. East Aurora definitely has its fair share of bars, after all, what else can you do in the middle of the Western New York winter aside from drinking? One of these is Riley Street Station, which is about as close as I can get to my office and drink. In two near back-to-back visits, I was given the rare chance to judge a restaurant on more than one order that I could claim solely for myself. In the land of Western New York, a great battle is being waged over Americanized Mexican fast food. In one corner there is Taco Bell, perennial favorite around the country. In the other is Mighty Taco, a local favorite with just about as much connection to Mexico as general stability (read: none). Yet, I knew I had to try it out to see what kind of competition it is to the first love of my life. Throughout the Buffalo area is a place called Jim’s SteakOut, which is known for its subs and tacos, but mostly for servicing drunks in need of something greasy to fill their bellies. Fortunately, there is one in East Aurora that was just waiting for the right moment to get in touch with me. The moment came recently enough, and with a few drinks in me I felt it was time to get steaked out. 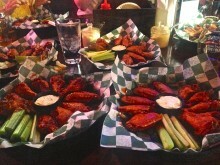 So many wings. So little time. As you may or may not know, buffalo wings originated in Buffalo, New York. And living right down the road from Buffalo, I’m now qualified to know a few things about the area. One of those things is that there is no such thing as Buffalo wings up here. Here they’re just called chicken wings because otherwise it would be redundant. You know, like calling French fries just fries in France. And one place famous for chicken wings is Bar Bill Tavern in East Aurora.